Sweat bees are attracted to the salt in human perspiration and even though they don’t attack, they often land on people for that reason – but, for an unlucky Taiwanese women, the bees ended up in her eye, attracted to the salt content in her tears. A 28-year-old woman from Taiwan was found to have four small sweat bees in her left eye, according to the BBC. She was apparently busy pulling out weeds when the insects flew into her eye. Dr Hong Chi Ting from the Fooying University, who treated the woman, told the BBC that he pulled the 4mm insects out of her eye by their legs. Fortunately, the woman could be discharged and will make a full recovery. 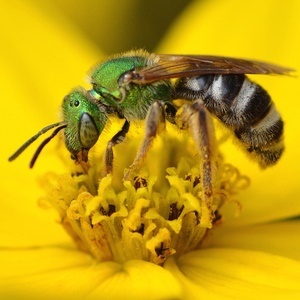 Sweat bees, also known as Halictidae, are attracted by human perspiration because of its salt content and will often land on people to imbibe perspiration. These insects tend to focus on human eyes because of the high protein and salt content in tears. According to news reports, the woman, known as Ms He, was weeding around the graves of her relatives when she something entered her eye. It was windy, so she assumed it was dirt that got into her eye. Hours later, however, her eyes felt tender, sore and swollen, so she decided to visit a hospital. "She couldn't completely close her eyes. I looked into the gap with a microscope and saw something black that looked like an insect leg," Dr Hong, an ophthalmology professor at the hospital, told the BBC. "I grabbed the leg and very slowly took one out. Then I saw another one, and another and another. They were still intact and all alive." According to him, it could have been disastrous if she had rubbed her eye while the bees were stuck inside. Because she wears contact lenses, a lens could have broken and induced the bees to produce venom, which could have caused her to go blind. She is now on her way to making a full recovery. Don't rub your eye, as this may cause further scratching or damage. Gently pull the upper eyelid outward and down over the lower, and hold it to encourage tears to flush out the object. If this is unsuccessful, rinse the eye with water or eye drops. If this still doesn't work, and you can see the object floating freely on the white of the eye, or if the object is in the corner of the eye or on the inside of the lower lid, carefully try to remove it. Wet the tip of a cotton bud or a corner of cotton swab or tissue with water, and gently touch the object with the tip. It should cling to the moistened tip. Never use hard items. Don't try to remove an object which is in front of the iris or embedded. Flush the eye again after the object has been removed. If all else fails, cover the eye and seek medical help. A Canadian woman was left with half her body paralysed after doctors failed to diagnose a spot on her ear as shingles. A British researcher suggests an untreated eye ailment may have helped Leonardo da Vincigenius perfect his masterpieces - but not everybody's convinced. With people going blind, sleeping with your contact lenses is a lot more serious than it looks. Megan Goodman qualified as an optometrist from the University of Johannesburg. She has recently completed a Masters degree in Clinical Epidemiology at Stellenbosch University. She has a keen interest in ocular pathology and evidence based medicine as well as contact lenses. Q: Volgens Dr kan inspuiting ander oog wat kolle het help. Is dit so? Q: Can glaucoma trigger macular degeneration? Q: Can military duty trigger cataracts? WATCH: How do you know if you're colour blind?